Yesterday someone told us she had baked a cake recipe from one of her favorite authorities, and it was “inedible.” We asked to see the recipe. While she is an experienced baker, in her rush she grabbed baking soda instead of baking powder. It’s an easy “oops.” Some recipes use both leveners, but if only one is called for, be sure that it’s the right one. Baking calls for very precise chemistry. So what’s the difference between baking soda and baking powder? Both baking powder and baking soda are chemical leavening agents that cause batters to rise when baked, by enlarging the bubbles (gases) in the batter. Sometimes you want a little rise (in a cookie, for example), sometimes a lot (in a fluffy layer cake). Baking soda, also known as bicarbonate of soda and by its chemical name, sodium bicarbonate, is about four times as strong as baking powder. The acid-neutralizing quality is what makes baking soda, dissolved in a glass of water, a cure for upset stomachs. It’s the key ingredient in Alka-Seltzer, launched in 1931. There’s also aspirin in Alka-Seltzer, but take extra tablets for the headache portion of a hangover. Baking powder consists of baking soda plus cream of tartar (and/or sodium aluminum sulfate, both “acid salts”) and cornstarch. The cornstarch absorbs moisture so the chemical reaction does not take place until a liquid is added to the batter. Baking powder creates a better rise than baking soda. 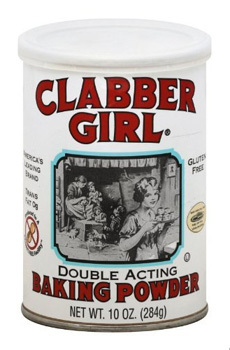 Nearly all baking powder made today is “double acting,” containing two different types of acids that react at different times and make the baked good fluffier. The first acid creates gases when mixed with the liquid in the recipe, the second type creates gases when the batter is exposed to the heat of the oven. Using the wrong leavener can cause bitterness and/or toughness and a compact (not fluffy) crumb. Once you’ve made the mistake (and we did, when we started to bake), you’ll never do it again. We still keep checking back and forth from the recipe to the can or box: Soda, soda, check. Soda, soda, check. Only then do we add the leavener to the batter.